We make judgements about people all the time without knowing much, if anything, about them. The guy I roomed with for most of my first two years of college is one of the best. Brian Johnson started as an architecture major, then became a mechanical engineering student at North Dakota State University from 1986 to 1991. We shared rooms, first in Stockbridge (a.k.a., “Jockbridge”), then in University Village. You’d be hard pressed to meet a kinder, more laid-back or unassuming person. Highly intelligent, too. Today he’s the vice president of global engineering for a Twin Cities firm. He was also one hell of an offensive lineman. Brian was the left guard on Bison football teams that won national championships in 1988 and 1990. He was huge. At 6’7” and in the upper 200s, he was no one to mess with. Still is huge, and antagonizing him would still be foolish. But, then, Brian’s a gentle giant. Whatever negative came his way then, and whatever comes his way now, seems to roll right off his back. Brian’s son is in his second year at South Dakota State University, where he, too, plays football. Offensive lineman. Huge, too, like his dad, at 6’6” and 275 lbs. in only his redshirt freshman year. My old roommate is tremendously proud of his son, not because of football, but because he’s a dad. This past weekend, when SDSU came to the Fargodome to take on NDSU, Brian sent me a text. He had an extra ticket. Would I want to go? Heading in, the Bison were ranked #1 in the Division 1 FCS Subdivision and the Jackrabbits were #3. Huge game. National implications. All that. 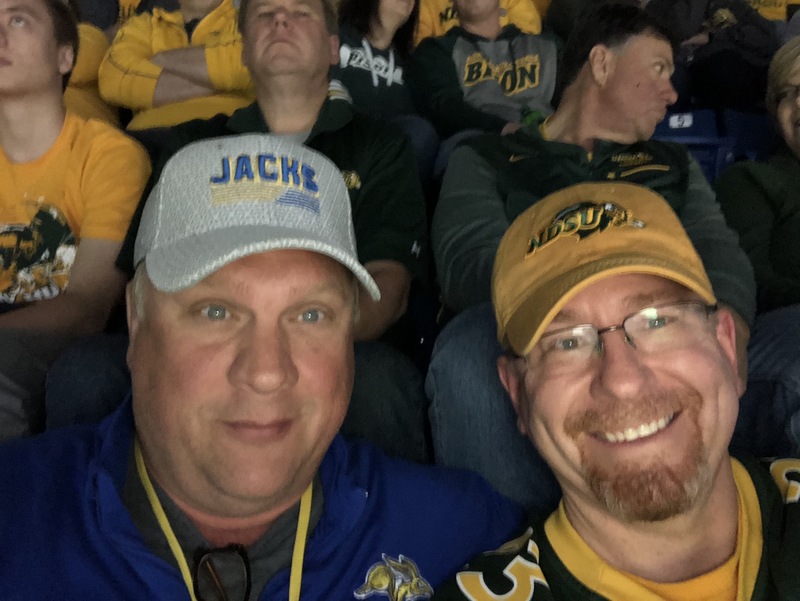 As we climbed the stairs to our seats, Brian in front in his blue Jacks sweatshirt and me sporting NDSU green and yellow, I watched the Bison fans’ reactions. Mostly I saw interest, some welcoming, and definitely wonder at the big man’s size. But there was also some disdain and barely checked desire to say something derogatory. People around us gave Brian grief, but backed off when he explained his son is a player for SDSU. He didn’t share his NDSU and football bona fides. There was mostly respect after that, although I still heard a mumbled, “Yeah, well, but…” a couple of times. During the game, Brian talked about how strange it was, sitting there with dual loyalties pulling in different directions. Sometimes it seemed like he didn’t know whether to clap for both sides or just sit still. If you’ve never been on a collegiate team, you (and I) don’t understand the strength of the bonds of brotherhood/sisterhood and the deep loyalty that comes with them. But those of us who are parents know how intense the bonds are with our children. Brian leaned more toward SDSU throughout the game. As he should have. Afterward, NDSU fans stuffed the concourse as everyone made their way out of the Fargodome. One started heckling Brian. He kept on walking, as if that guy and everyone else around us were nothing to get bothered about. Granted, one shouldn’t extrapolate too much about people or society or life from fans of different teams getting on each other. Happens all the time, and it’s mostly in reasonable humor. Even so, it got me thinking…. We don’t know their histories, likes or dislikes. Their political or sexual persuasions. Whether they’re rich or poor, jam to country or metal, what moves them or what they couldn’t give two shits about. We don’t know if they played on national title teams or for whom. But we also don’t know if the people casting aspersions lost a job recently, had their car repossessed last week or got dumped by a girlfriend/boyfriend the night before. Maybe they’re a jerk, but maybe there’s more to it. One thing’s for sure: if someone’s heckling you, it probably has nothing to do with you personally. I was one of those fans once, but now I mostly see other people fervently supporting their schools and their teams, just like me. My catcalling days are over. These days I do my best to treat others with outward decency, regardless of what color they are, what colors they wear, who they love, who I think they vote or cheer for, or what their motivations might be. And I try to follow the lead of people like Brian. The heckling really doesn’t matter, so don’t respond. Let it roll off your back. Just keep on walkin’. Appreciate others’ covers for what they are. Or don’t. Either way. Turn the page. Just keep on writin’. Previous Previous post: Flowers are Rainbow-Colored. People are Weird.